Theraposture provided successful Rotoflex and Mascot seminars and new educational literature at Rise 4 Disability (7 th Sept, Kent Showground). Rise 4 Disability is a free exhibition that provides the latest products, services and information to assist with independent living. As one of the leading specialists exhibiting at the show, Theraposture demonstrated its fully future-proofed Mascot cot and proven Rotoflex rotational bed on stand B1 and during a series of educational presentations. Paediatric and Adult Healthcare Professionals and Occupational Therapists were able to see first-hand why Theraposture and its products are the considered choice. Liam Braddell, Theraposure Sales Director, demonstrates why the Mascot Mk2 is the only fully future proofed care cot at Rise 4 Disability. In addition to live product demonstrations, Theraposture provided copies of its latest educational literature – a guide to assistive turning bed systems. This guide contains vital information for professionals, families and disabled users so they can make more of an informed decision regarding rotating bed selection. It highlights the many factors to consider so that independence is maximised and the pitfalls of selecting an inferior or inappropriate product can be avoided. Theraposture’s proven rotating bed, the one and only Rotoflex, was on display at Rise 4 Disability and generated high levels of interest from visitors. Its leading ergonomics, quality and the unmatched range of sizes, user capacities, entrance heights and aesthetic design options were clear to see. Its vertical seat lift functionality was highlighted and demonstrated as the considered safe sit-to- stand solution for users struggling with balance and weight bearing as the Rotoflex does not tip users forward like a riser chair and other rotating beds. Paediatric OTs and families were keen to understand more about the Mascot Mk2 cot at Rise 4 Disability.The educational seminars delivered by Liam Braddell, Theraposture Sales Director, provided the opportunity to understand why this height adjustable cot is the most cost-effective, long-term choice. 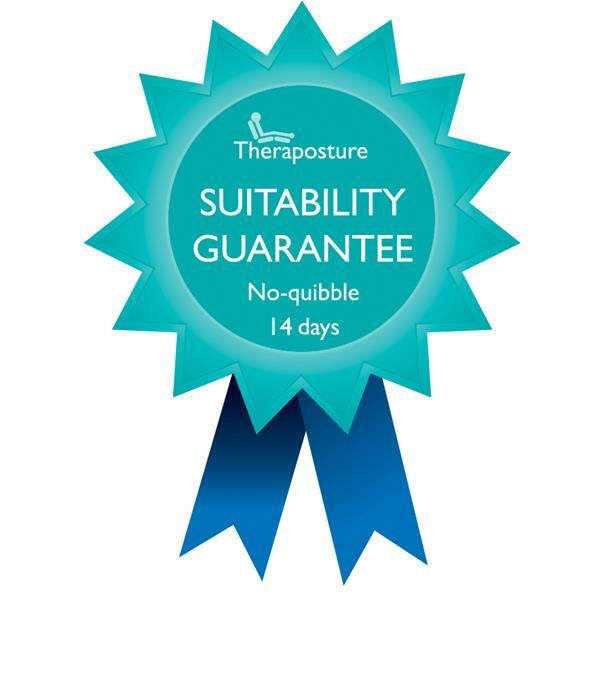 Information regarding this popular market leading product was provided along with the new cot funding guide from Theraposture – another essential piece of educational information that assists professionals and families. Rise 4 Disability, 22.02.17, Stand C1, Peterborough Arena, East of England Showground, 9am – 5pm. 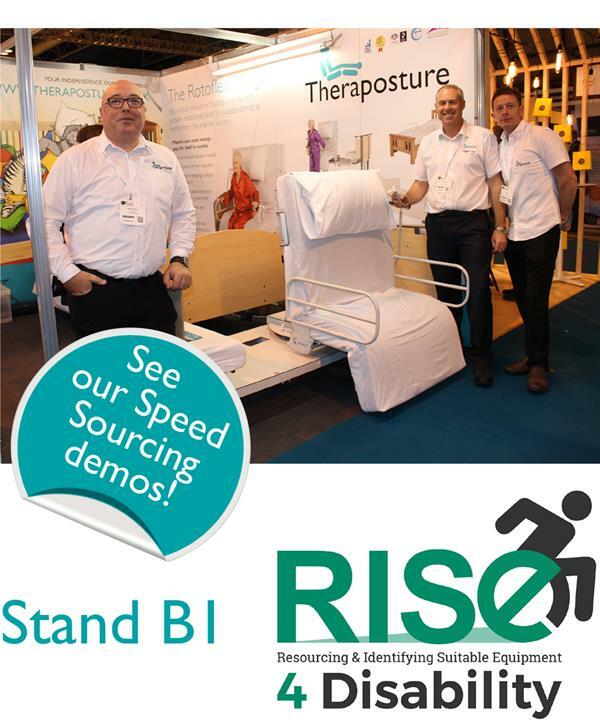 As the leading specialist in assistive beds, chairs and care cots since 1981, we will be attending Rise 4 Disability and would like to invite you onto stand C1. Come and discover why our products deliver outstanding comfort, quality, safety and value – all backed up by an impeccable and ethical service. Our Rotoflex rotational bed will be demonstrated at the event as it is the original and proven solution for getting in and out of bed safely and independently. Our trusted Assessor will be available to explain why the German-engineered Rotoflex is the trusted and ergonomic choice for people and clients with neurological conditions such as MS and Parkinson’s. Developed over 20 years, the Rotoflex range from Theraposture is the widest available with tailor made designs specifically handcrafted to solve individual needs. Through its profiling, height adjustable and rotational action each Rotoflex will move a user from an upright seated position to a recubant position and vice versa – in a controlled and safe manner. With this powered assistance, users can remain in their home for longer, get in and out of bed on their own terms and reduce the need for moving and handling support.